Dogs will step into a size that fits with the Wrap and Snap Choke Free Dog Harness in Black! 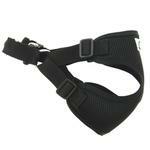 Be ready for anything with this easy-to-use Wrap and Snap Choke-Free Dog Harness in Black. The Wrap and Snap Harnesses by Doggie Design are easy to use, lightweight, soft and feature dynamic colors and prints. 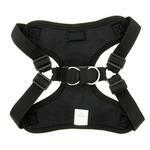 You'll love the classic look of this black harness. It's a ready-to-wear style that is comfortable and durable. 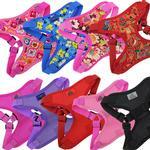 Even hard-to-fit pets will find their perfect adjustment with the four-way adjustable straps. Broad chest? Narrow ribs? Once you've set your perfect choke-free adjustment, you won't have to fuss with it again. Now you're ready for adventure because you just wrap, snap and go! There are double D-rings for leash attachment for added security. May we suggest one of our Barking Basics Leashes in Black to complete your look? Made of 100% polyester. Hand wash separately, line dry. 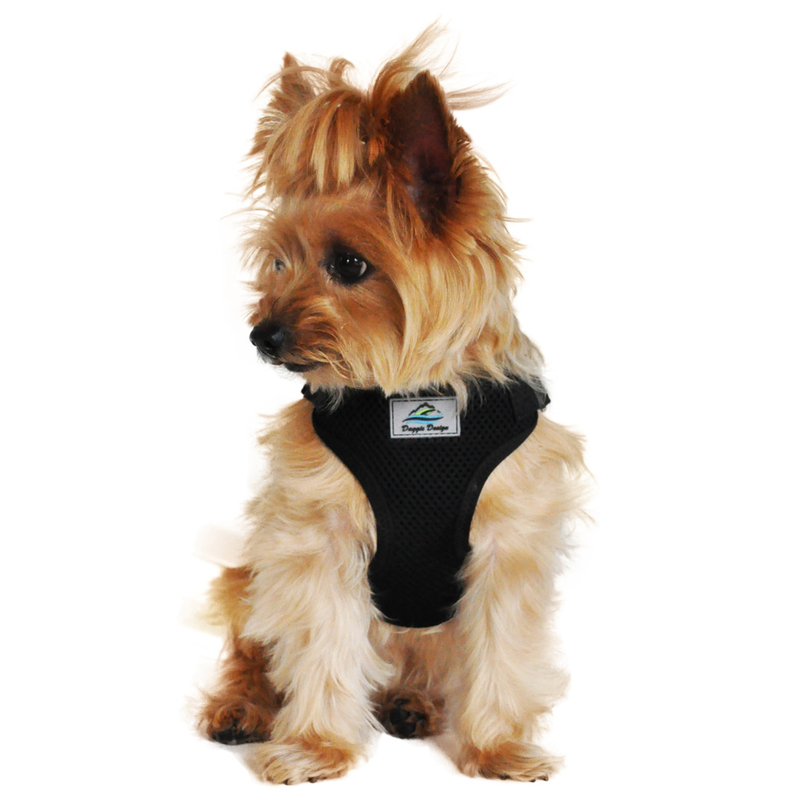 Look for our other solid mesh colors and designer print Wrap and Snap Choke-Free Dog Harnesses, sold separately! Posted On 04/23/18 by Roxann M from Reading, PA Yes, Roxann M recommends this product! I love the wrap and snap dog harnesses for my Chinese Crested. They fit her perfectly and she looks like she feels comfortable in them. I have several different colors for her. These are the best fitting harnesses that I have found for her!! It's a decent harness but some things I would change are: The double d-rings clink & clack constantly when the leash is not attached. The rings are too thick to attach the leash that I have, and they are too thick to attach dog tags. I also wish the logo patch was not on the chest. Posted On 11/05/17 by Karlee B from Atlanta, GA Yes, Karlee B recommends this product! These wrap and snap choke free harnesses are the best harnesses I've found for my little yorkie. I love that they are adjustable, so I can get that perfect fit. I've tried other harnesses, but none of them fit the way these do. They would all be tighter in some places, looser in others, so that the weight was never evenly distributed. I'm so happy I found these. We now have three in different colors and designs, and we are slowly building our fashionable collection. Posted On 08/25/17 by Kathy H from Janesville, WI Yes, Kathy H recommends this product! I'm impressed with this harness! It's adjustable for a good fit! Well made and very sturdy! Love the breathable mesh fabric...seems it will be comfortable as well! I chose a medium for our 10lb. girl. The adjustability will enable her to wear it over or under a coat or sweater. Would definitely recommend this harness. Posted On 06/13/17 by Joanne T from Toms River, NJ Yes, Joanne T recommends this product! I love this harness for my puppy Jax. He's 10 lbs and wears a S or M with the easy to adjust straps. I have the harness in several colors including the new one with summer surfboards because they're a life saver for me and my baby. Posted On 12/05/16 by Jennifer C from Pittsburgh, PA Yes, Jennifer C recommends this product! 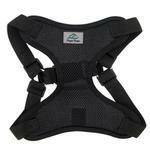 These harness are comfortable and choke free. My pup is too small for a collar lead. My 9 pound maltipoo wears a size small in this style. This can be worn over clothes or under styles that have a harness hole. Posted On 11/16/16 by Judy from Bridgeton, MO Yes, Judy recommends this product! A good quality harness that is very adjustable to fit your dog. It is easy to put on and take off! I purchased several other colors! Posted On 08/29/16 by Andy B from Palm Desert, CA Yes, Andy B recommends this product! we are an animal rescue site who fortunately receives donations that allow us to purchase little harnesses for our shelter dogs. The wrap and snap harness is easy to use, especially on a dog that may never have had a collar or harness on before. the colors are adorable, and allow our homeless dogs to look great at adoption events. Baxter Boo is a pleasure to work with, and the pricing is wonderful. Posted On 05/27/16 by Heather C from , Yes, Heather C recommends this product! This harness fits my 13lb pug puppy very well, and it is very stylish! Posted On 04/13/16 by Pam B from , MN Yes, Pam B recommends this product! We bought this for my daughter's GSD puppy. It fits nice and comfy, he adjusted to it quickly. It's a nice harness that doesn't choke. He is the runt and has a few challenges, blind in one eye which messes with his balance and strength. So much better than a collar for him! I love their products. The selections are affordable and practical.